ok.... my timing always seemed to be off, so why should I be surprised that my attempt at blogging is any different?? I am anxiously awaiting my first blog challenge.. I should be receiving it in the mail this week. 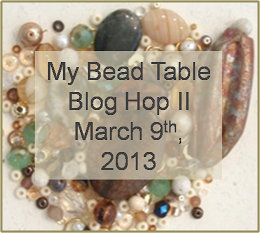 Then I need to get going on the beadsoup challenge... I know what my theme will be, just need to think about it and decide where I want to go with it. I am really looking forward to getting creative after about a month's forced hiatus. all for now... see ya on the flip side.